Welcome to my Midwest Radio Museum. I would like to share with you my collection of over 80 different models of Midwest and Miraco radios. 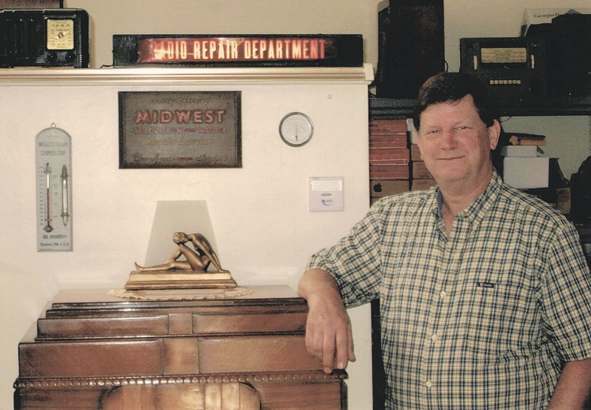 This collection represents over 25 years of searching and collecting as Midwest radios are not easily found. I’ve had an interest in old radios and electronics since I was a young boy. I found my first Midwest during my High School years in the back room of a Radio & TV store in Kalamazoo, Michigan my hometown. Although I had never heard of a Midwest, its unique looks and large 18 tube chassis told me I want this radio. I offered the salesman one of those then new pocket transistor radios in trade for the Midwest, which he quickly accepted. After bringing the radio home and repairing the chassis, I found it had great sound and excellent short wave performance too. I spent many hours listening to foreign broadcasts and DXing with my Midwest. In the mid 60’s, after several years of tech school and working as a radio and TV technician, I landed a job as an electronics technician with a large aerospace firm in Northern California. A few years later I became a member of the California Historical Radio Society and renewed my interest in old radios and radio collecting. Thanks to a CHRS member, I soon obtained my second Midwest radio. It didn't take me long to learn that most of my fellow collectors didn’t think much of Midwest and wanted little to do with them. I also discovered there was much more competition in collecting the more popular makes of radios so concentrating on Midwest made sense to me. After all, I liked them and somebody needed to so why not me? Today I find myself retired and living in Northern San Diego county (I'm a country kind of guy). I still enjoy restoring old radios as a hobby and looking for Midwests that I don't have.